Carey’s Jaide Parke drives on Richfield’s Sasha Kent on the Tiger hardwoods Tuesday night, as Carey senior Micaela Adamson (background) follows the play. Richfield won 50-32. Courtesy photo by John Peck. Northside Conference girls' basketball tournament action begins today, Friday at Murtaugh High School and will pick up steam with five games at the same site Saturday. The Community School of Sun Valley (0-13), currently the ninth seed, will take part in a play-in game with No. 8 Bliss today, Friday at 7:30 p.m. The winner of that game will play top-seeded, unbeaten Dietrich (18-0) Saturday at 7:30 p.m.
Two junior varsity games will also be played today, Carey meeting Castleford at 4:30 p.m. and top-seeded Dietrich taking on Murtaugh at 6 p.m.
On Saturday, the championship of the single elimination JV tourney is at 1:30 p.m.
Then the varsity tournament resumes with No. 2 seed Richfield going against No. 7 Lighthouse Christian Academy at 3 p.m. and No. 3 Carey playing Murtaugh at 4:30 p.m. The 6 p.m. game features No. 4 Camas County and No. 5 Castleford. Varsity tourney games continue Monday and Tuesday, with the participants in Wednesday's 7:30 p.m. championship game certain to represent the conference at the State 1A Division 2 tournament Thursday, Feb. 16 at Nampa. On Tuesday night, last year's state runner-up Richfield (13-5, 7-1 league) won at home 50-32 over Carey (9-6, 5-3). Micaela Adamson led Carey with 11 points while Tawni Smith and Michaela Edwards each had 11 for the Tigers. Meanwhile, the Carey boys (11-6, 6-0 league) captured their eighth straight win Tuesday by a 59-23 score at Richfield (4-12). 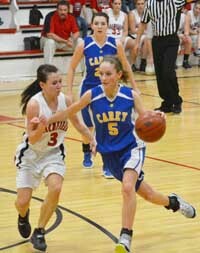 Carey visits Hagerman (7-8) Saturday for a 2:30 p.m. game.